Washington, DC – Enjoy the beautiful weather this autumn while getting into shape. 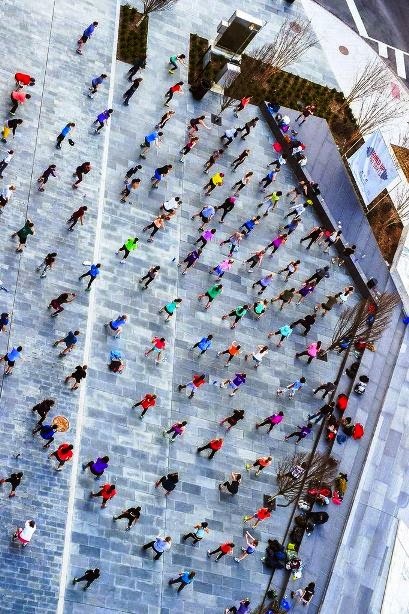 Every Tuesday evening in September and October, instructors from VIDA Fitness will conduct a different workout in The Park at CityCenter (corner of 10th and I streets NW) starting at 6:00 p.m. (weather permitting). The Toned Up Tuesdays program is free and open to the public in an effort to promote a healthy, sustainable lifestyle in the nation’s capital. Participants will receive fitness swag from CityCenter DC, City Sports and Flo Activewear as well as healthy snacks, shakes and special offers from Protein Bar, 2armadillos and Healthy Bites. September 9 – Fierce Funk (45 minutes): Fierce Funk is a new, exciting dance-fitness program founded by Pepper Von, one of the most respected and creative dance-fitness practitioners. Pepper’s creation combines a street style funk movement with a contemporary hip-hop feel, for an inspiring, fun and complete workout. His vision is for instructors to bring a sense of fun, empowerment, passion, energy and a philosophy of love toward others to their classes through dance and fitness movements to energizing music. The Fierce Funk culture is not just fitness and dance, it is a moving energy intended to refresh the spirit with fun, fulfillment and love so Fierce Funk participants are more healthy and happy. September 16 – Power Yoga (45 minutes): Designed to build strength while increasing balance, flexibility, and endurance. Expands on the sequences of Vinyasa to incorporate more challenging arm balances, inversions, and twists in conjunction with deep breath to detoxify the body. September 23 – Boot Camp (45 minutes): VIDA Boot Camp is an intense calorie burning program providing fun, creative, and challenging moves that keeps participants focused, empowered, and constantly moving towards their fitness goals. Workouts include a wide variety of constantly changing circuits including drills, games, obstacles, plyometrics, relays, weighted supersets, and partner training. October 7 – Zumba (1 hour): Combines Latin dance moves with interval and resistance training for a full-body, rhythmic workout. You'll move through salsa, mambo, cha-cha, cumbia, merengue, hip-hop, and belly dancing on your way to one of the most satisfying cardio workouts you've had in years. October 14 – Power Yoga (45 minutes): Designed to build strength while increasing balance, flexibility, and endurance. Expands on the sequences of Vinyasa to incorporate more challenging arm balances, inversions, and twists in conjunction with deep breath to detoxify the body. October 21 – Conditioning (45 minutes): Fast-paced class with a variety of cardio combinations, calisthenics and plyometrics. Conditioning utilizes interval training to combine a series of high intensity spurts to increase power with lower intensity active exercises to continue burning calories and improve cardiovascular endurance. This class is an excellent training tool for athletes, runners, or anyone looking to obtain a high level of personal fitness. October 28 – Yoga (45 minutes): Yoga is an opportunity for gentle movement, stretching, simple breathing exercises and seated meditation. It is ideal for learning beginner poses, relaxation techniques and terminology. For more information on Toned Up Tuesdays please visit: www.citycenterdc.com or email Events@CityCenterDC.com. Find CityCenterDC on Facebook: www.facebook.com/CityCenterDC and on Twitter: @CityCenterDC. Toned Up Tuesdays is part of the 2014 Public Space Programming calendar that was created by the CityCenterDC Common Area Association. CityCenterDC’s ownership created the Common Area Association to provide for the maintenance, operation, and programming of the Common Areas. The Common Area Association strives to foster a unique, truly exceptional, pedestrian-friendly mixed-use urban environment that includes retail, residential, civic/cultural and entertainment uses. Moreover, it seeks to preserve a place that is first and foremost for the city and its residents, and appeals to Downtown workers and visitors. The Common Area Association works to maintain a great urban space with the highest level of quality and innovation in urban design, integrate the visual and performing arts throughout the site, establish new and lasting traditions, and facilitate street-oriented retail success.